Urbanopolis, city of silicon and gold, the towers of industry. It stretches across the plain from inland sea to cloud tipped mountain. But this triumph of mankind has a dark side: Filthy vicious vermin fill in its cracks and flood its crevices turning Urbanopolis into Verminopolis: City of Filth. They seethe beneath the pavement and screech from the rooftops. They have prospered and evolved by dining on the debris of civilization. But, now the parasites have usurped their host; they have thrown off the yolk of humanity. They will no longer tolerate man’s heavy hand. 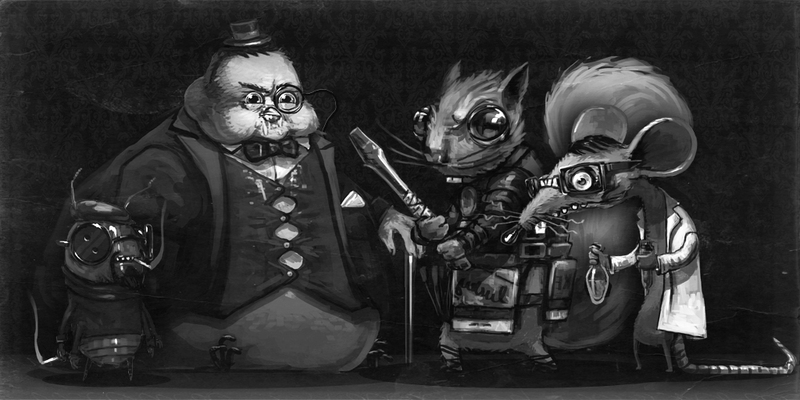 The pigeons of the Verminopolis Pecking Squadron (UPS); the rats of the Rodentian Alleys and Sewers Administration (RASA); the squirrels of the Secret Order of the Nut (SON); and the roaches of the Arthropod Revolutionary Militia (ARM) rage in the sewers and trees of battling for ultimate supremacy. Verminopolis: City of Filth is an irreverent and fast-paced urban combat board game, utilizing figures styled after the booming designer toy and street art aesthetic. The board is modular and the characters are unique. Gather your army and prepare for battle in the trash infested alleys of Verminopolis! Beneath feet and beyond the understanding of man a war rages. All that remains is for you to decide the victor.